You can tell by the poor quality of the picture that I am a rank amateur, but it's all I've got! 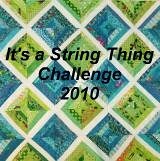 This is my FIRST string quilt, and I learned a lot! Lessons learned: (1) center strip is all-important! (so don't use dull gold and brown next time...) (2) save some bigger strips for the corners. (3) Figure out how to make the blocks so that they don't peak at the intersections. I quilted it diagonally across the grain, plus in the ditch. Is that what caused the peaking? I did do FMQ feathers in the border, which I was pleased with. All in all, I really enjoyed making this quilt, and donated it to the local Police Department. That is our guild's charity of choice this year. They use the quilts when they remove children from their homes. You've done a super job on your first string. Aren't strings fun!! It's a fantastic quilt. I love the colors. Such a terrific place that you are donating it to. Let's keep it up ladies. I have about 7 more small ones that I quilted this weekend. I'll upload them probably this week sometime.